There’s no denying that the Tacoma is one of Toyota’s more well-known models, and the popularity could be attributed to the pickup’s combination of luxury, impressive specs, and reliability. After all, Toyota vice president and general manager Bill Fay had previously said that 75-percent of the nearly 3 million Tacomas sold over the past 20 years are still on the road, and the truck has continually received high marks for it’s aesthetics and power. As Mark Williams of PickupTrucks.com explains, Toyota was looking to "emphasize a sportier personality," and that sentiment can be seen on their 2016 Tacoma. As the designers "accentuated the cut lines over the wheel arches and reshaped the front grille," they managed to give the truck an entirely revamped look. The cut lines were affected by the resized squared openings on the front and rear wheel wells, as well as the more "prominently defined" bulging fenders found stop the wheel flares. Meanwhile, the grille was revamped to look more similar to the trapezoidal grille that accompanies the 2014 Tundra. While Williams warns that some may believe the vehicle looks too much like some of it’s fellow Toyota trucks, the writer believes the new designs gives the truck "a more cohesive, rugged look with more room." A solid portion of the front of the truck features that identifiable "box-shape," with the rest of the truck looking similar to the C-channel design. To assist with any potential accidents, Toyota has added more high-strength steel to the middle of the frame. This should provide a stiffer "platform" for the truck, and should reduce damage if a crash actually does occur. Steel was also included in each individual body panel, which the brand hoping that it will reduce the truck’s overall weight. As Williams points out, the 2016 model will have practically an identical weight to the 2015 model, but the new truck will also have an increased maximum payload (1,620 pounds) and maximum towing capacity (6,800 pounds). There’s also an assortment of trim levels that can be chosen from, including the entry-level SR, the SR5, the TRF Sport, the TRD Off Road and the top-of-the-line Limited. Each of these selections is distinguishable by their various "grille colors, chrome highlights and paint color matching," but the TRD packages have particular features that make them stand out. For instance, the Sport offers a unique hood and a mock intake scoop, while the Off Road also features a unique hood (more smooth, less ‘sporty’ than the other TRDs) and a lack of a lower air dam (which helps improve the truck’s angles). Out is the 4.0-liter V6 engine, in is the Atkinson-cycle 3.5-liter V6 engine. Ironically, the smaller engine will result in an increase in horsepower (278 hp) and torque (265 ft-lbs). The vehicle will also be offered with either a revamped six-speed automatic transmission or six-speed manual transmission, which includes a "sportier center console shifter that allows for tap-up and tap-down shifting." Some of the trims come with the standard 2.7-liter inline four-cylinder engine and six-speed automatic transmission. As Williams notes, for all of the changes to the exterior, you’d expect little differences between the 2015 and 2016 Lexus RX’s interior. Unsurprisingly, Toyota has outdone themselves. It starts with the dashboard and center console, as both are compact enough to leave plenty of storage area. The 4.2-inch information screen may lack the size of other infotainment centers, but the Tacoma’s technology is reportedly straight forward and easy to read, revealing information like fuel economy, tire pressure, and mileage. Considering the interior is different for each trim, drivers may receive specialized features such as "soft-touch plastic, cloth and anodized aluminum." One consistent is the new seats, which offer the drive with more comfort and significantly more support. Finally, Toyota has seemed to solve their issue of having a noisy cabin. After including sound-reducing materials in both the floor and roof liner (as well as extra lamination on every single window), the cabin sound has reportedly been reduced considerably. In fact, Williams guesses the lack of sounds would rival the segment leader in cabin noise, the GMC Canyon. 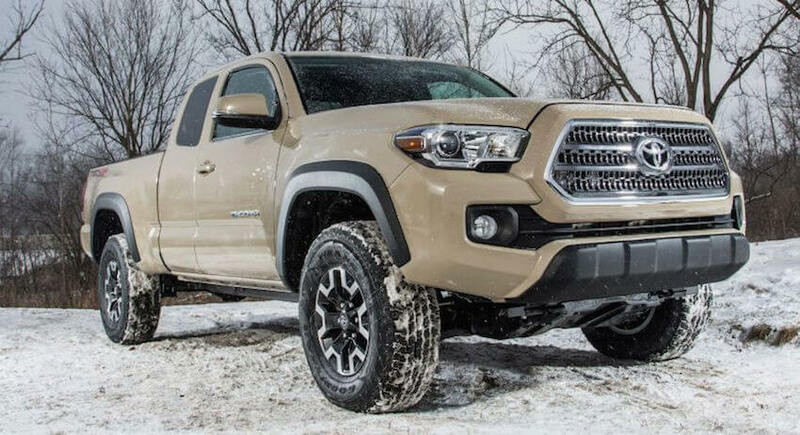 If you opt for the TRD Off Road trim, you certainly won’t be disappointed with your Tacoma’s abilities. While the brand has typically been conservative when it comes to off-roading features, Williams notes that Toyota went full out for their 2016 model. Having created a "Rubicon Trail-like rock sluice built out of boulders and jagged granite rocks," the company assured that their vehicle would be one of the best trucks on the market by including Crawl Control, which allows drivers to adjust their downhill speed based on the terrain. All the driver has to do is steer. As the writer describes, the company wanted to prove how effective their Crawl Control was. The buried a Tacoma in a pile of soft sand, and they watched as the truck maneuvered it’s way out. The test was ultimately successful. "It was like watching an autonomous vehicle problem-solve its way out of a perilous situation," Williams described, "essentially escaping from what normally would have permanently stopped any other vehicle." You’d also be able to drive in a variety of different conditions, as this particular trim utilizes the Multi-Terrain Select system, meaning drivers can choose which terrain they’re currently driving through, whether it’s rock, mud, snow or sand. Once a certain mode has been selected, the truck will determine the proper gears, transmission shift points, traction control parameters, and throttle and brake inputs. The 2016 truck will include a number of other notable features, like a backup camera, traction control, antilock brakes, and a newly-included lever handbrake. Starting at $25,000 for the standard SR Access Cab and $40,000 for the Limited Double Cab long-bed V6 4×4, the 2016 Tacoma is actually a very reasonably-priced pickup truck. So what are you waiting for? The truck should be hitting car lots relatively soon, and you can begin your search by visiting Rochester Toyota. Even if you’re not targeting a Tacoma, the helpful staff will easily find the right pickup for you.